← Fancy Schmancy Painted Paper! As promised I am going to show you what I did with the painted papers I did the other day. drum roll please……haha..that may be a bit too much of a buildup! I had these small white pots I purchased in the knockoff bin at the grocery store for $1 and they had been taking up space in my studio for a project “someday”–you know how that goes! I tore the paper into random strips and used glossy Modge Podge to adhere the strips to the sides of the pot all the way around. I wasn’t too calculated about this. I’m not one to measure and plan every move. I added some gold paint pen in some areas. So far so good as far as I’m concerned. Then I had the brilliant idea to use some gold Shiva paintstick on some areas. I figured if a little gold is good then a lot more must be better right? no no no…this did not turn out the way I thought and I began to hate this pot! I’ve had this happen before where I just can’t seem to leave well enough alone. I began wiping as much of the paintstick off as possible and there may have been some cussing involved. Once again my brain whirred into motion and I thought I could mix some pigment powder into the ModgePodge and add another layer over everything. I used some brilliant yellow/orange pigment powder and liberally slathered it over everything. After it dried I liked the sheen and added the layers of ribbon around the top. I used round orange rhinestones as accents. But why stop there?? I decided to add some silk blue flowers. Flowers make everything better right?? I first tried putting them on with Modge Podge but that didn’t work as I hoped. They wouldn’t stick except to my fingers—grrrr. I decided to use some PVA glue to get them to stick and then Modge Podge over them when they were dry. It was a battle but I was not about to be beaten by some blue blooms! 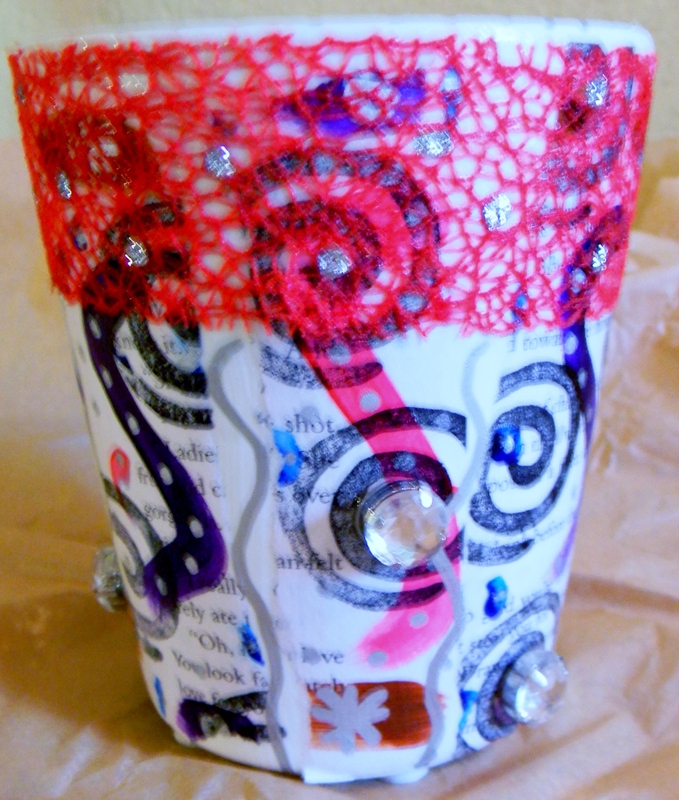 Several layers of ModgePodge and more orange rhinestones later this pot was finished! 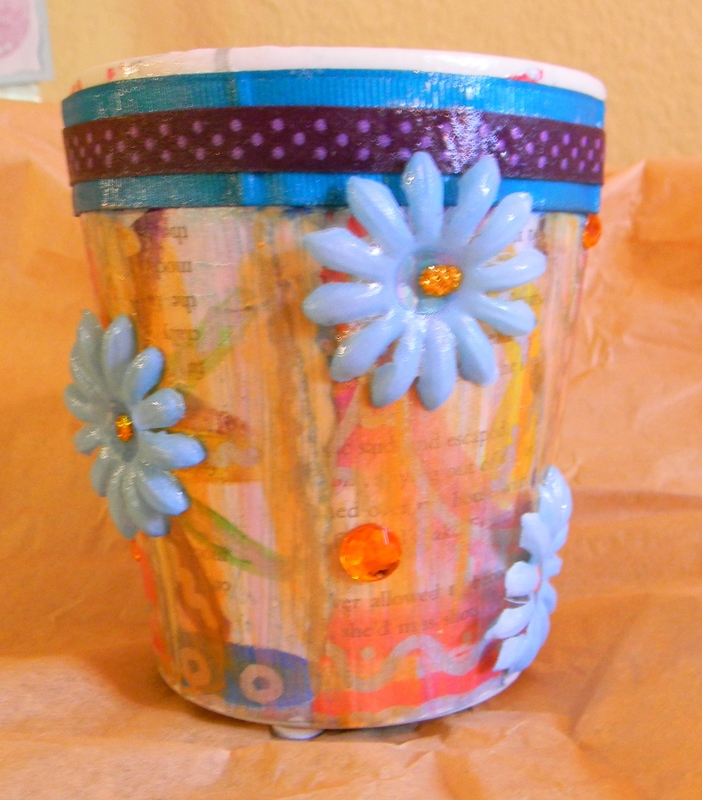 On this pot I first stamped some bold swirls on the painted paper before I tore it into random strips. Once again used glossy Modge Podge to adhere the strips. Added some cool mesh ribbon I’d been saving for a special project! Added silver paint pen and silver Stickles for some sparkle. Coated the whole thing over with glossy MPodge and remembered I had some big chunky rhinestones! Who can resist those??? Not me. This one is probably my favorite of the ones I’ve done. I love the vibrant colors and patterns. Same theory as before–rips random strips, glossy MP all around. 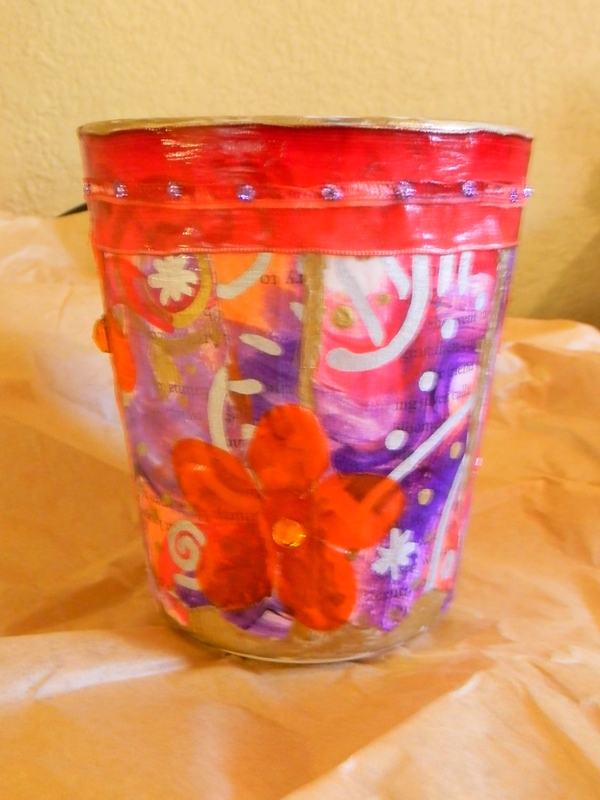 Added gold paint pen in areas, added two layers of ribbon around the top. Purple Stickle dots and then orange silk flowers. I learned that flowers with larger and fewer petals are MUCH easier to adhere to a rounded surface like this pot. Used the last of my orange rhinestones for the flower centers. I’ve debated adding some gold paint pen dots to the orange flowers but haven’t because I’m alittle gun shy after the paintstik debacle on the first pot. 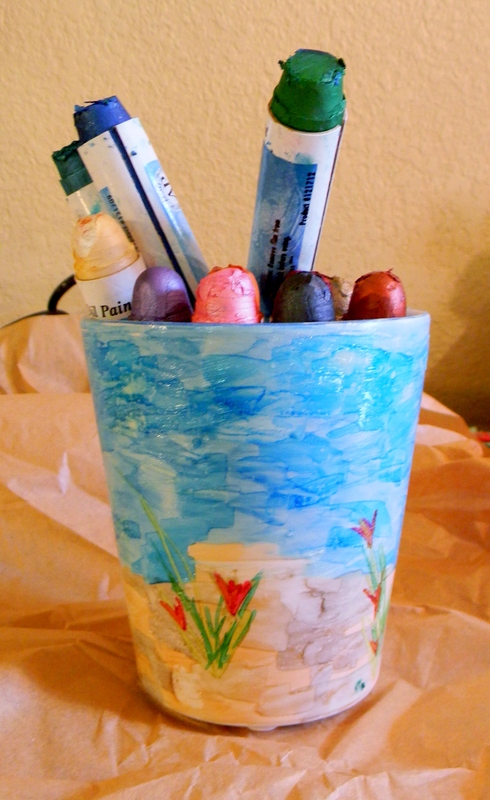 These next two pots I did not use the painted paper I made. They were actually the first two of the white pots I embellished. I used Copic markers. Also the first time I used my Copic markers. My crude rendition of a beach scene on this one. I sealed it with glossy ModgePodge because I like the shine! Experimented with combining colors of Copic markers and I love sunshiny yellows and oranges! Added a couple of rubons to the sides and colored them in. 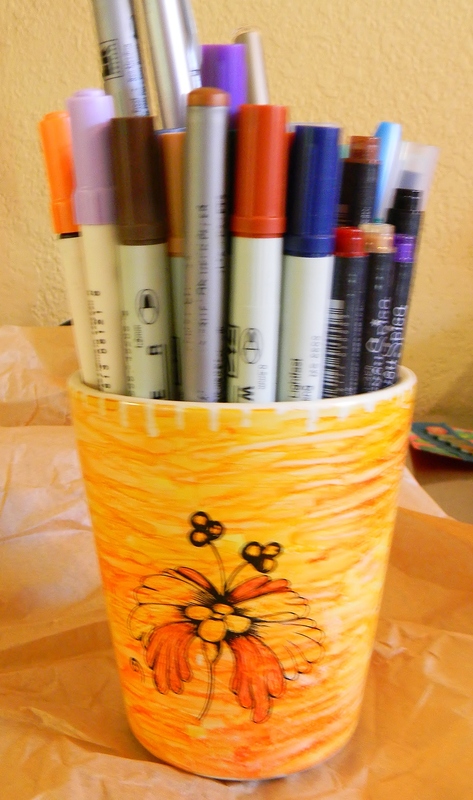 Now I have a couple cheery cups for my markers and paintstiks! Still have about 5 of these bargain bin white pots. Who knows what I’ll do them??!! Thanks for looking!